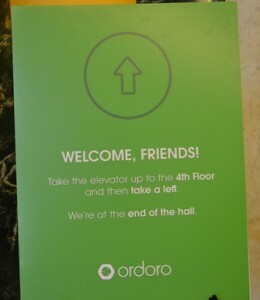 Ordoro is an e-commerce business owners dream. Their suite of tools to help e-commerce professionals who actually ship products help save time and increase the bottom line. Nibletz co-founder and CEO Nick Tippmann, owned an e-commerce business as a junior and senior in high school that made over six figures in his senior year, not too shabby for selling electronics out of his parent garage. When we first arrived at Ordoro and found out what they were all about Tippmann admitted he really could have used that in the early part of the 2000s. The Austin based startup raised $1.2 million dollars in a Series A round last summer. A huge feat for a startup that was passed up for Capital Factory. Austinstartup.com reports that it’s no loss though because Capital Factory founders Joshua Baer and Bill Boebel participated in the round. We started our trek on the ATX SXSW Startup Crawl at Ordoro and it was a pleasure meeting co-founders Jag Narayan and Naruby Schlenker. Schlenker took a few minutes with us to tell us all about Ordoro and how to say it like an Italian. We’ve got a ton of SXSW 2013 coverage here.